It's been tempting lately to conclude that Apple doesn't have it anymore, and tablets in particular is where Cupertino does need to silence the prophets of doom and gloom after an iPad 4 that was more like a 3.1 and a mini that should've had a retina display. To begin with, they could've done a lot worse than borrow a line from macbooks but the Air signature isn't just a PR stunt. It would be hard to believe it's the first time an iPad Air crossed anyone's mind as a cool name for a tablet but, by the looks of it, the iPad Air is very well the first that actually warrants it. Just sounds right, doesn't it? And the iPad Air will definitely need all that crowd-pleaser ring when the fresh iPad mini with Retina display finally starts hitting the shelves. With Nexus tablets around, usual suspects Samsung, the new Surface, and now even Nokia on the list, an iPad has never arrived to such an unfriendly welcome. Yet, if Apple has done its job right, the Retina-flaunting mini will likely be the biggest threat. 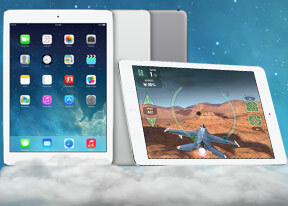 But let's not get ahead of ourselves and give the iPad Air a proper introduction. Easily one of the hottest pieces of hardware we've seen deserves it. Honestly, to say that a diet was all the iPad needed would be a massive understatement - after the iPad 4, which deservedly gets retired. But the way the iPad Air looks is a start made in heaven. The Air is almost 2mm thinner, and has unbelievably lost near a centimeter on each side - it's mostly screen bezel that's gone. The weight difference is the whopping 183 grams. The screen - the same gorgeous 9.7" canvas with 2048 x 1536px resolution. Comes with premium set of free Apple apps - Pages, Garage Band, etc. Along with the impressive loss of weight, the iPad Air has really stepped on the optimizations. There is a smaller battery powering the tablet but Apple promises the same 10 hours of battery life as before. The brains behind the tablet are the same as on the iPhone 5s - a class-leading 64-bit dual-core A7 chip that should be twice as fast as the predecessor's. The GPU is even a little more capable than on the iPhone, in keeping with the bigger display and higher resolution. Apple took a big step in the right direction with this year's iPad lineup by equaling the mini and the Air's specs, so the only thing you need to choose is the screen size that works best for you. This puts the iPad Air in a sticky position, as the mini's handling and portability could be the big decider. The iPad Air, by the way, is now much more comfortable to hold and the narrower casing does wonders for single-handed operation but there's no avoiding the fact that the iPad mini is the friendlier form factor. Last season's bigger iPad at least had the luxury of being more powerful but those days are gone. Yet, it might turn out in the end that it's the mini that has more to live up to - and prove that it truly is an equal in terms of performance. The iPad Air on the other hand seems off to a promising start. Let's see if it can really keep it up. If the screen broke, is there available screen in the market to have it replace? ?